While food in Malta can be very cheap in the capital, La Valletta, and the small villages inland, budget options are much harder to find in the touristic areas by the beach. Despite being at the crossroads of most of Mediterranean travel routes, Maltese cuisine is far from been Mediterranean. Instead it is a fusion of styles, while the Sicilian touch is predominant there are a lot of Arabic and British influences too, due to the large periods in which the small archipelago has been colonized. On contrary to neighbor hilly Sicily, where land is very fertile, Malta soil is not very rich, so don’t expect anything comparable to the fantastic flavours of the biggest Italian island. The Maltese eating habits are heavily based on carbohydrates, bread especially. Malta has the highest number of overweight people in Europe and one of the highest rates of diabetes in the world. Since most of the tourism filling the hotels in summer are coming from UK, the most common option for eating in touristic cities are pubs that serve dishes cathering to working class taste : fish and chips and hamburgers. Expect to pay around 5-10 euro for such options. In Malta, there are only few hostels and guesthouse for budget travellers. Most accommodation options consist of hotels with their own restaurant offering buffet options: that mean everything is mass produced using the cheapest possible ingredients. The cheapest places to get good budget food in Malta is from the pastizzerias, very popular among the locals. The best in the business is the chain called Maxims Pastizzeria, known for the best pea pastizzis (pea cakes) on the islands of Malta and Gozo. Pastizzis usually come with two fillings, mushy pea or ricotta cheese wrapped in a flaky pastry. They are good any time of the day and are considered one of the greatest hangover recovery foods ever made. 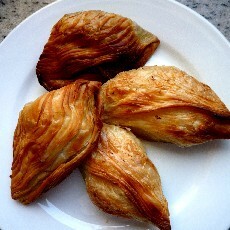 Unfortunately, many pastizzerias run out of pastizzi by lunch time. The price of pastizzis start at around 25 Euro cents, so you can have as much as you want! Other great value budget food including timpanas and ross (ross il-forn means rice in Maltese), burger pies, and greasy pizza. The timpana is a meaty pasta bolognese covered with a pastizzi pastry topping and the ross is rice in a meaty bolognese. these snacks cost less than 2 euros each, and are often served in generous portions. Expect to pay the same price or slightly more for a burger pie and the typical Maltese greasy pizza slices, with hard boiled eggs on them. A local seasonal dessert is prinjolada, but you can find excellent cannoli Sicilian style all year round. If you want your meal in a restaurant, the set menus are your best option if you are on a budget. To check the latest trend on local favourites, Mona’s Meals independent reviews that you can find on the newspaper Malta Today’s Sunday Edition or on Planet Mona, are a trusted source. If you want my personal recommendation, Pennette maltese in Ta Kris Restaurant is Sliema had the best meal I had in Malta: great in quality and quantity. Local specialities worth trying are lampuki (dolphin fish, the season is from August to January) and bragioli (beef olives, but be careful: olive is referred to the thin cut, there are no actual olives in it!). Locals eat lots of fenek, or rabbit: stuffat (stew) or moqli (fried). Very popular in colder days is minestra, the Italian name for a vegetable soup. In the smaller island of Gozo you can find gbejina, a special goat cheese that comes in small and round formes. The local beer is called Cisk, it has a fresh taste but not a high percentage of alchool (4.2), typical of beer produced in warmer climates and a sweeter taste than most European lagers. At a little more than 1 euro per half pint it’s well worth trying! Malta has two indigenous grape varieties: Girgentina and Ġellewza. Although most Maltese wine is made from various imported vines. Maltese wines directly derived from grapes are generally of a decent quality, Marsovin and Delicata being prominent examples, and inexpensive at 60-95ct per bottle. If you want something of a better quality, then Meridiana is the premium choice. There are also many amateurs who make wine in their free time and sometimes this can be found in local shops and restaurants, especially in the Mgarr and Siġġiewi areas. A soft drink unique to the archipelago is Kinnie, that has a bitter sweet orange taste. Claudio Secci began vagabonding in Milan, Italy at the age of 3, when his favourite game was tying up his possession in a bundle and leave home for a new adventure. The travel bug grew mostly quietly, except some flashes like when at the age of 17 he traveled alone around Europe for a month. He started a real vagabond life on a December 2003. Since then he didn’t stop. In the last 10 years he has explored 63 countries and has worked as a Massage therapist and Yoga teacher. And now he keep obsessively ask himself what he is going to do next. Apart keep travelling, of course. Visit his blog at i viaggi di clach. Claudio Secci has written 3 posts on Vagabond Journey. Contact the author.